Human Body on a Chip from MIT and DARPA could change biological warfare, medicine. 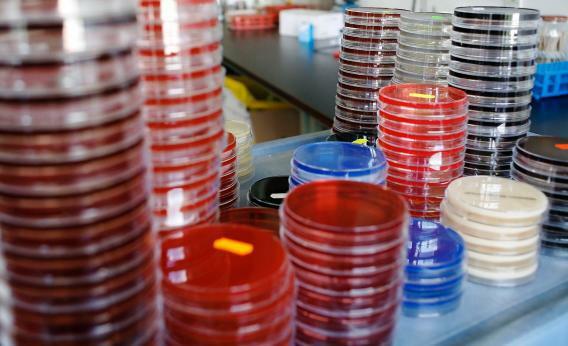 Perhaps the biggest problem in developing medicine: Testing in the Petri dish doesn’t come close to the real thing. Even with the great strides we’ve made in the lab, the vast complexities of the human body can’t be re-created by a few cells in a vacuum—or, for that matter, on an animal test subject—with perfect accuracy. Any drug company pharmacist or engineer will tell you: The race for a cure is a marathon, not a sprint. One challenge is that liver cells can act differently in your liver than they do individually in the lab. Griffith likens this phenomenon to her and her husband: If you put her in a cold room, she doesn’t function well—but her husband thrives. Put them both in a hot room, and her husband is miserable while she does fine. Building microscale, fully operational environments—a tiny bionic liver with all the characteristics of a larger liver—could cut down on unpredictable or inconclusive results by offering a more whole picture of a treatment’s effect on the body. This could have big implications incredibly complicated diseases like cancer. Having a “body on a chip” could help researchers understand exactly how the little metastasized tumors around the body—not the original source tumor—ends up killing a person. DARPA is interested because of the potential applications for pandemics. Griffith says since this new technology could make developing a drug lightning fast by comparison to the current process, it could have a huge impact on how the country deals with an outbreak—whether devised by nature or by a human entity that wants to cause widespread illness. Could a government agency use the technology to develop in the other direction—creating biological weapons, instead of defending against them? Griffith says it’s never been a part of the project. What about the idea that these tiny organs, using bits of tissue and miniscule pumps and plastics, could be writ large—a new line of bionic organs that take the idea of the pacemaker to the next level and provide us with replacements? Griffith scoffs at that.